You may remember over the summer, Washed Out had an ice cream inspired by one of their LPs, Paracosm, made at Brooklyn’s Oddfellows Ice Cream. 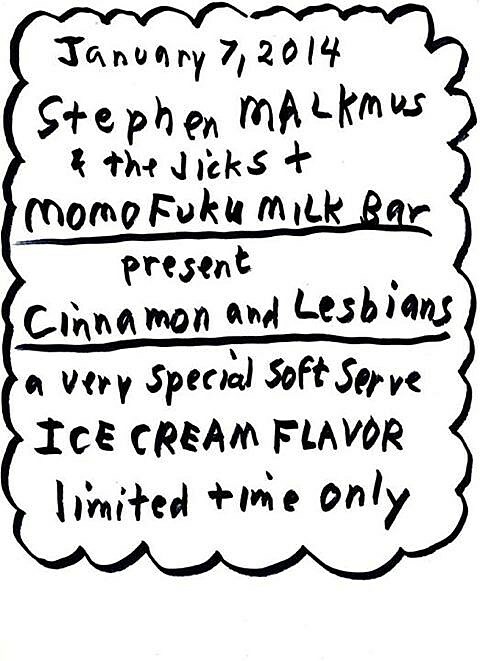 For those who need more frozen treats inspired by music, Momofuku Milk Bar will be introducing a new soft serve flavor inspired by Stephen Malkmus & the Jicks‘ new single “Cinnamon and Lesbians.” While it’s bound to have the spice of the title, if the music in the song is any indication, it maybe be closer to Cherry Garcia. (Check out the “Cinnamon and Lesbians” video below.) The non-vegan dairy product will make it’s debut on January 7 at Momofuku locations around NYC. January 7 is also the release date for the Jicks’ new album, Wigout at Jagbags, which you can hear a week early via Amazon starting at midnight on January 1. And you can still enter to win a few spots at that private Other Music show that happens January 9. In other food-named-after-indie-rock news, Eater reports NYC pizza mini-chain Two Boots has added a new signature slice: The Animal Collective. Named after the band, it is a very un-vegan slice (as you might guess). They’ve also got “The Meg,” named after Meg White which is a four-cheese white pie. Eater also has the news that Two Boots will take over the Williamsburg space formerly home to Driggs Pizza (who had a great grandma slice).